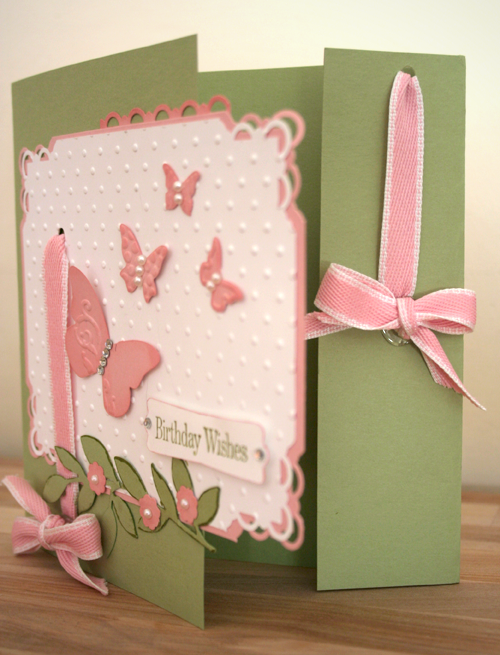 Good afternoon everyone, I'm not sure I should make summery cards any more, yesterday the rain bucketed down! 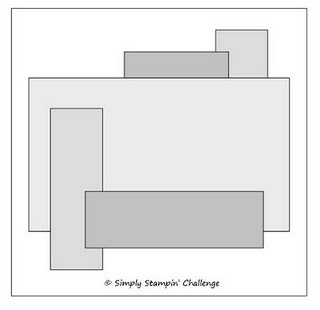 Today's card is for a challenge at Simply Stampin' Challenge and they are well worth a look, particularly since the emphasis is on Stampin' Up products. This week's challenge was a sketch and oh boy was it difficult! 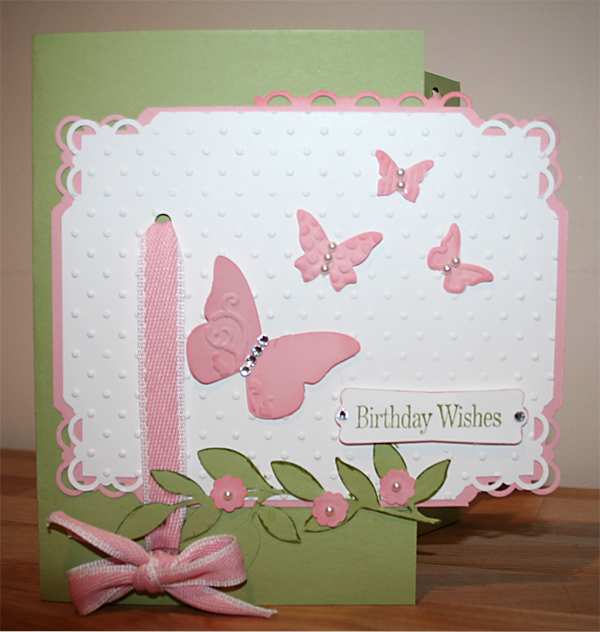 I have never followed a sketch for a card before, although I have used them for scrapbooking. I found that it really made me think about placement and design before actually making the card, rather than once I was already started. As I have said before, the challenge really made me move out of my comfort zone so I am really pleased about that. This is the sketch we had to follow. It is quite complicated an full of layers, not my usual style at all. I also decided to make it even more difficult on myself by deciding to do a gatefold card (where the card opens from the front rather than the side) which I normally don't make. I'm quite pleased with my design, although I had to work really hard to incorporate all of the layers. It's quite hard to see, but the top two layers on the sketch are the extra scallop trim in pink on the right hand side, and the ribbon on the right hand side. The main layer in the middle is the panel embossed with the Perfect Polka Dots embossing folder and the two remaining layers are the ribbon on the left hand side and the little spray of leaves from the Little Leaves sizzlet at the bottom. I tried to be imaginative in my interpretation of the sketch, using the ribbon and leaves as the layers and I have to say that I am very very pleased with the result. I have been stuck in a rut with square and A6 cards recently and although I like them, there weren't any that jumped up and said WOW. I really need to enter more challenges in future! 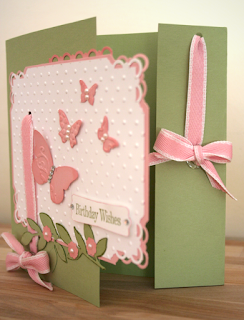 Here is the card from a few different angles so you can see what I have done. The butterflies are from my favourite Beautiful Wings embosslit and sponged with Blushing Bride ink, then adorned with the basic rhinestones and pearls. I can't believe how long these have lasted, I'm still on my first packet of each! So I hope you have enjoyed today's card as much as I have enjoyed making it. The in colours this year are just gorgeous, and as you can see, work really well together. Don't forget that you can buy all of these supplies and more from me 24 hours a day and that this month and next Stampin' Up are offering an extra £20 free spend to hostesses (or big enough orders!). I'd love to hear from you so why not contact me on 07795474490 or cpoxon915@gmail.com. Aww thank you Karen, you say the nicest things! That's beautiful Claire ... love those colours!